As technology is now a part of our everyday lives, we cannot imagine a world without being able to instantly connect with one another. We recently took this theme to heart with out latest photo shoot involing a fun couple of seniors enjoying various wireless technology. 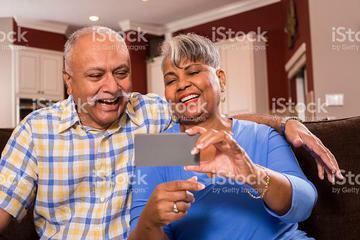 Whether video chatting with the grandchildren, surfing the internet, or online shopping, the latest mobile devices keep you connected. Thanks so much to our wonderful models for making this shoot such a success! To check out more images from this shoot as well as all of our "Tech-Savy Senior Adults", click the link below. To view or download the image above, just give it a click!